Level 2 and 3 Catering & Hospitality students took part in an Industry Networking Event in January. 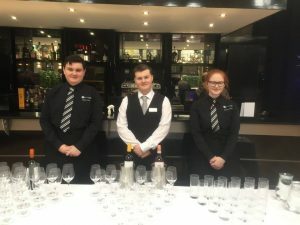 They met with local employers in the industry and served them sample canapes and desserts, handmade by students from Buxton & Leek College and the University of Derby. They then watched a demonstration in the lecture theatre and took the local businesses on a tour of the Devonshire Dome, which is also used as an event space, fine dining restaurant – which can be visited by the public – and has seven purpose-built catering kitchens for students to learn culinary skills in. To find out more about our Hospitality & Catering courses at Buxton & Leek College, click here.